Meet the Artisans | STEAMED! Steampunk has come to embrace so many varied arts, well beyond just fiction. I’d like to introduce you to a couple of the artisans who make the stuff that makes us all look so good. Where can shoppers find your products online? Riveted seam (no sewing) leather clothing. Mostly skirts, kilts, and pocket-belts. Do you do this full time or is it a side job? How did you get into steampunk, personally and as an artisan? I think, for me, the two’re inseparably linked. I love non-traditional construction methods (example: to make a skirt, I use rivets instead of thread). I see a great deal of the above in the overall steampunk aesthetic. Descriptions and images of things that at the first seem over-built, stylized, or overly ornamental can too be taken as, say, a plumber’s take on a message-delivery system. Using your knowledge or trade to solve situations that they may not at first seem applicable to…I love seeing that. 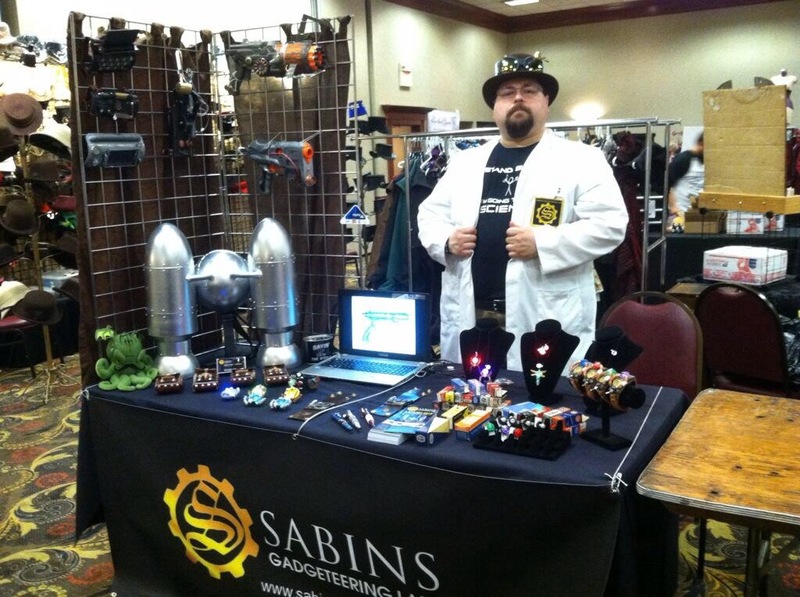 What’s the hardest thing about being a steampunk vendor? Not going to panels when you’re at a con. 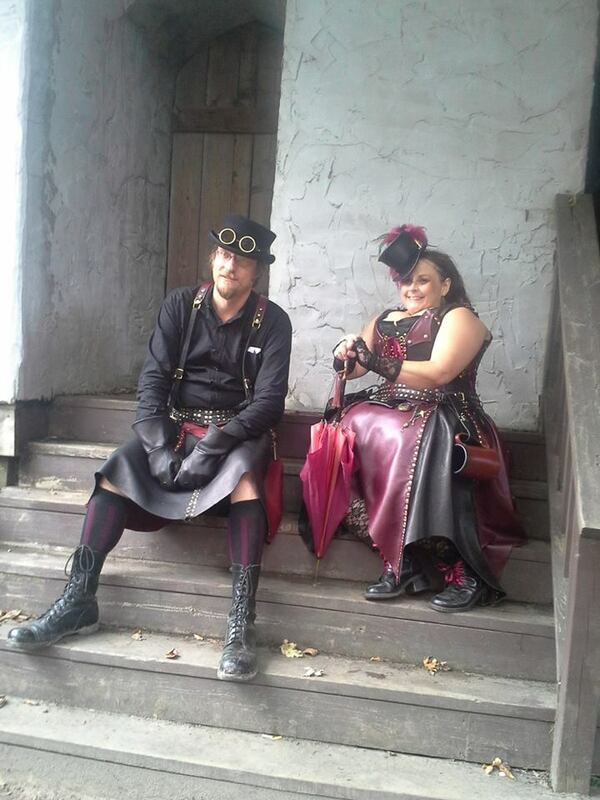 What is your very favorite thing about steampunk and the people involved? If there is a defining aspect of steampunk, I’d call it creativity. No, really, bear with me as I “define” steampunk here. Every single steamo out there brings something to the table. Every. Single. One. At a comic or sci-fi convention, you have some great artists, writers, actors, cosplayers, etc., but for every one of those folk, there are at least a dozen fans or collectors. (Which, by the way, is great.) In steampunk, that ratio is reversed. Participants create their own character, or their own costume. They all add to the ambiance. most of us have *some* project or other we are working on, be it a light-up Nerf mod, a hover pack , a moving picture, a moving piece of poetry, an airship crew, a presentation, a new novel, knitting, we are all working on things, and most of us will happily enthuse, and share ideas to inspire and encourage one another. That, the building of this thing that we all enjoy together, that is probably my favorite aspect of steampunk. Custom costume props, accessories, and jewelry. My style tends towards Tesla-tech, usually with small glowing light effects to simulate strange energies of the Aether. Do you do this full tim e or is it a side job? Full-Time, my own business. I’ve tried pursuing conventional means of employment; it never really worked out for me. My first exposure to steampunk was the tabletop role-playing game, “Mage: The Ascension” by White Wo Studios. There’s a Tradition of mages called the Sons of Ether whose mad devices and eccentric style were steampunk even before the term had really caught on, and they were my fast favorite. I really love the strange mélange of mysticism and technology that they represent, and I began to try making Etheric devices of my own to use as props. That was more than 10 years ago, and I’ve been refining my methods with what I could afford ever since. The hardest thing about being a vendor is coming up with product ideas that are original enough not to infringe on other copyrights, but that have sufficiently recognizable value to customers who mig ht want to buy them. I often have to restrain myself from exuberant creativity and focus on making everyday stuff with a just a hint of mad science in them. My favorite thing about steampunk is that it is primarily fan-driven. There isn’t a lot of popular source material in films and television with steampunk as the main focus. There’s plenty of room to get in on the ground floor as it picks up steam, so to speak. As for the people involved, I’ve found most are quite friendly and well-mannered, and they seem to really like my creations. So now that you’ve met these two awesome creators, don’t forget to check out their work! Hopefully, these interviews will be a recurring feature, so if you’re an artisan, or know one who ought to be interviewed, send me an email at cindy@cindyspencerpape.com.